I ve some worries on how spells can be classified as mandatory, due to the area size of effect and their saving throw difficulty. As every players i hate RPG games when you know which spells you must use in loop. I m not familiar with 3.5 Rules but i ve played a lot with 3rd edition and i know how some spells can break a party during table games and when a dungeon master must cheat to avoid the game of ending. I really enjoy the Dungeon and Dragon contents but i can t believe every spells has been tested with different fights context, and we all know here how much work has been done by gibberlings community to balance things after Baldur 's gate released. Is my worries legit ? Will the game punish you if you don t have these mandatories spells ? Greetings, malax! Worry not about language! This is only true for the PnP, in say NWN spellcasters were severely underpowered compared to fighters. It depends a lot on the level range; wizards do start off as one of the weakest combat characters. Do you implement Chain lightining and Fireball delayed blast ? And basically, are parameters evocation spells a lot different from the original SRD3.5e ? 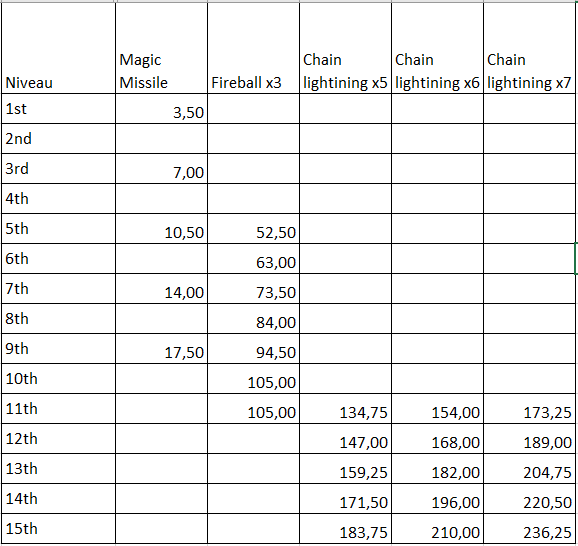 In this table we can take a look at the power of well known spells as Magic missiles, fireball and chain lightining. I ve done the spell damage per round for 3 hits with fireball and 5,6 and 7 hits with chain lightining. Even if Fireball hits only 3 ennemies, you can see that the burst damage is a multiple of 5 in comparaison of Magic missile. Due to the huge ratio between Magic missile and Fireball, Chain lightining seems not so bad with a kinda linearity of damage. I ve been also very disappointed with PoE cause the leveling of experience isn t at all kinda logarithmic, so i started with my hero with fun spells with hope to get a smooth and challlenging experience in picking and using spells but first levels were too short to enjoy how much the game could be rich.